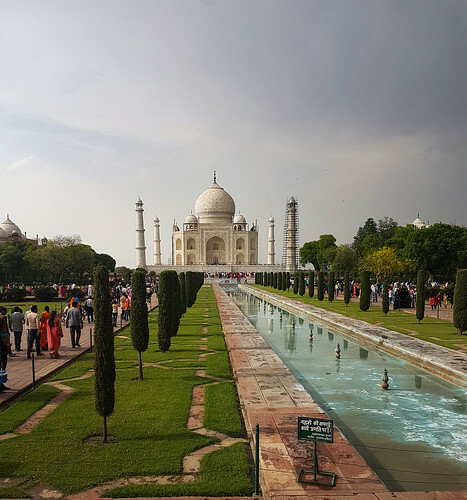 So since I had some friends over from overseas who wanted to see the Taj Mahal in Agra, on a friday morning we left New Delhi for Agra. 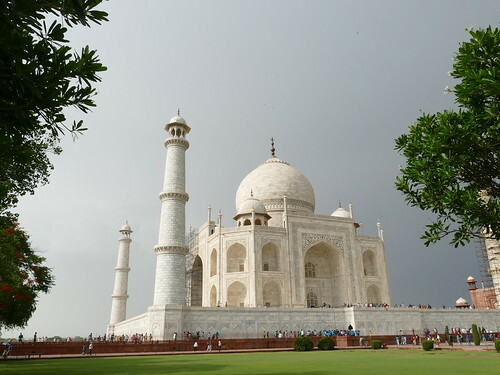 We took the Yamuna expressway by which you can reach the Taj Mahal in less than 3 hours from New Delhi. While it is among the best expressways in India, I would strongly suggest you to travel on this road during the daytime as far as possible because it is an extremely accident-prone road and it should be especially avoided during the extreme foggy periods of December end to January beginning. 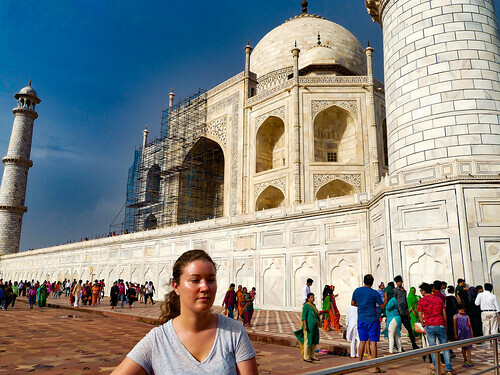 Soon we reached the majestic monument and our very knowledgeable guide took us to a side so we could have an almost voyeuristic look at the Taj. 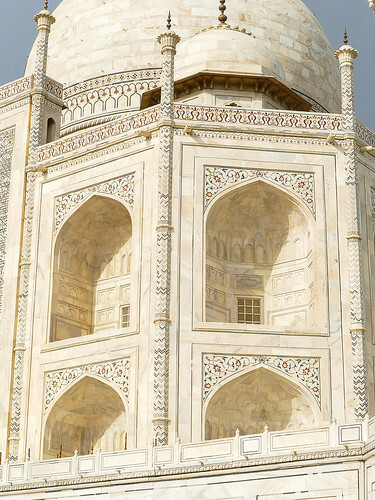 If you do a google image search for Taj Mahal, you will not see many images like the one above, most of the pictures you will see will be from straight on. I think the monument looks more beautiful from this perspective. 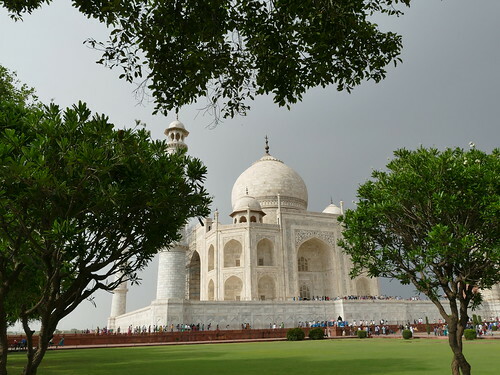 As you might be well aware, Taj Mahal was built by Shah Jahan, the fifth Mughal Emperor of India, to honor the memory of his favorite wife Mumtaz Mahal , who passed away at the age of 39 during child birth. See the picture above. 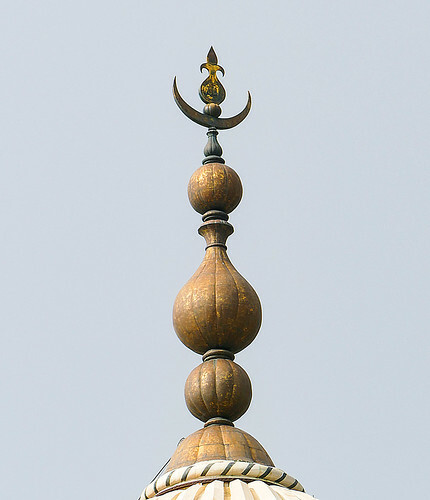 Along with the Islamic symbol of Crescent Moon , you will see an Inverted Lotus. In Buddhism too, the lotus represents purity and renunciation, floating above the muddy waters of attachment and desire. 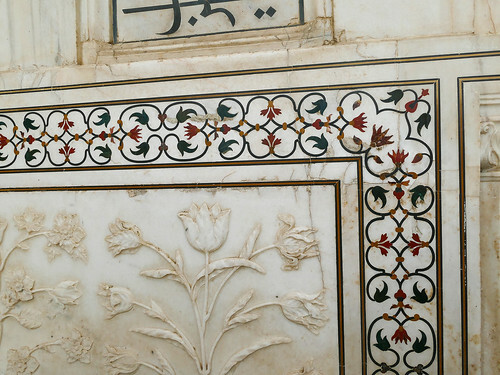 So the lotus (which is India’s national flower) was not just a big deal to Hindus and Buddhists since ancient times, it was a defining symbol. 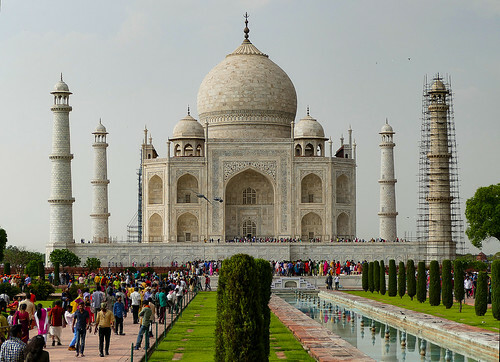 Because the Taj Mahal was built by thousands of Artists and workers, many of them Hindus, as a gesture of appreciation to them, and to show the secular nature of India where all religions are equal , Hindu symbols were incorporated into the architecture and design of the eternal monument. 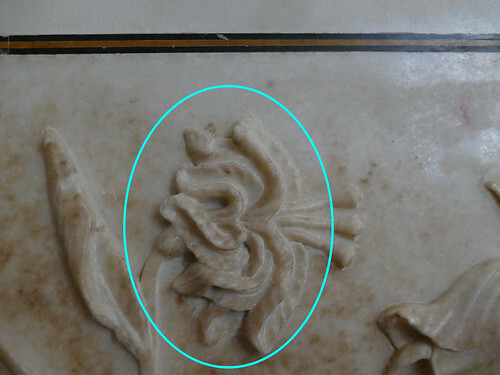 In the picture above, taken inside the monument, is shown the Sacred Hindu Symbol of OM. Om is a mantra, or vibration, that is traditionally chanted at the beginning and end of yoga sessions. 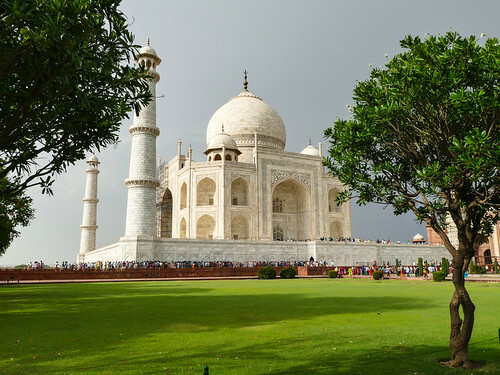 Coming from Hinduism and Yoga, the mantra is considered to have high spiritual and creative power but despite this, it is a mantra that can be recited by anyone from any religion. 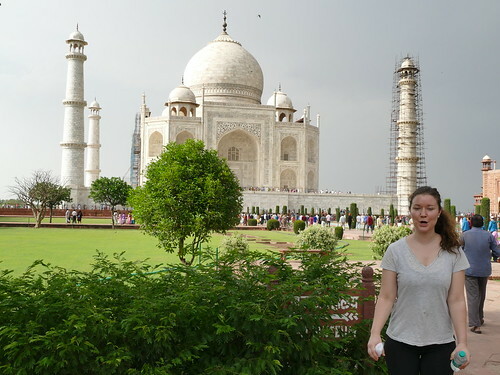 the O is stretched out and the word ends with an M. So its chanted like OOOOOOOOOOOOOM. 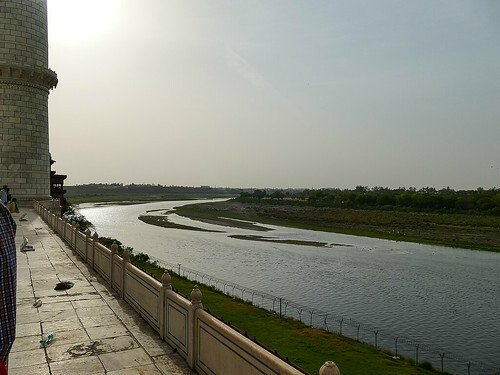 Now this is the back part of the Taj Mahal, the side facing the Yamuna River. 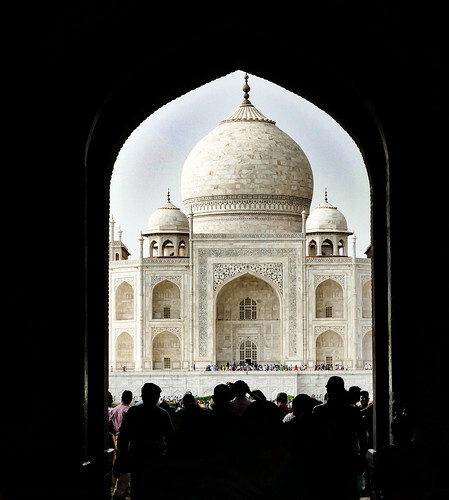 The Taj has an entrance on all 4 sides of the monument and what is not widely known is that this was the Entrance used by kings and royalty to Enter the palace who came on boats. 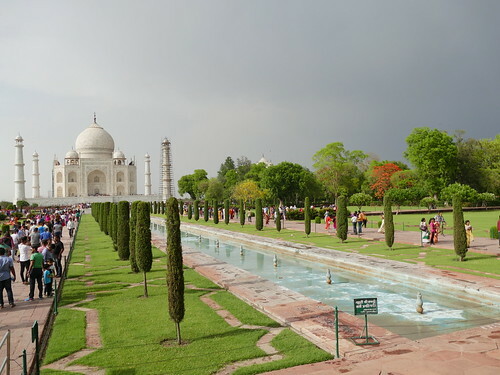 You can see from the picture above that the river flows really close to the Taj Mahal so this was (now the entrance is not used ) the shortest way to get to the main monument. 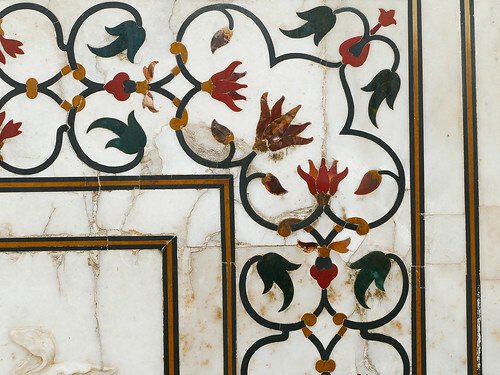 Because..Per Muslim law, graves cannot be adorned with elaborate decoration, which would be an inappropriate expression of vanity. 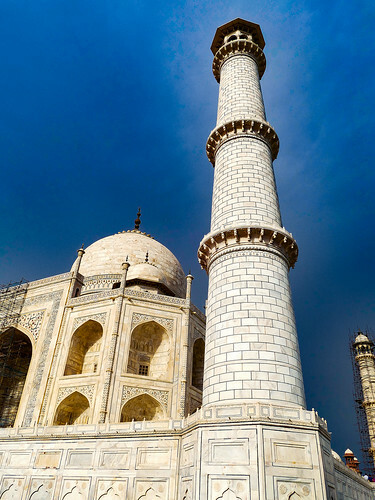 The 4 minarets ( spires/towers ) tilt away from the main monument so they never fall on the tomb. 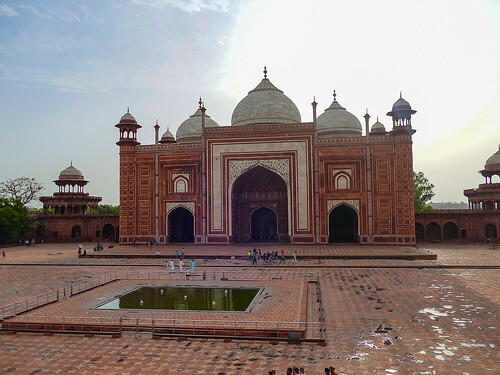 In the picture above, can you see the 4 Minarets( towers at the edge of the platform ) tilt away from the main monument ? 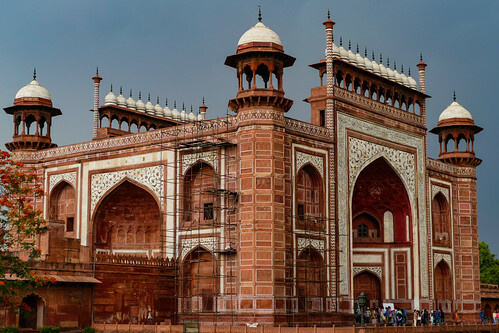 In order to protect the crypt of Mumtaz Mahal, chief architect Ustad Ahmad Lahauri tilted the towers slightly so that they would fall away from the rest of the Taj Mahal, preventing the grave from incurring any damages in the event of an earthquake or collapse due to other reasons. 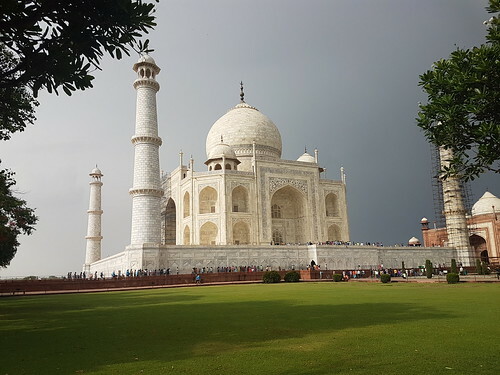 Some of the pictures I took during my visit..
Hindu artists worked on the Taj as well and as a mark of appreciation were allowed to carve Hindu symbols .